From start to finish our design and installation team at Bath House will collaborate with you, offering a complete turn key service to deliver a stunning bathroom renovation focusing on detail while maximizing your budget. The relationships that we form with our clients is the basis for our continued success. By understanding your wishes, we can use our extensive industry knowledge to create the bathroom of your dreams. A finished bathroom alongside a dynamic 3D drawing used during the design phase. From initial on-site consultation, we gather all the information needed to present a concept design and preliminary quotation. Our team of designers then develop the concept, drafting dynamic 3D drawings of your proposed new bathroom. From here we can discuss options, along with finalised costs prior to agreement and commencement of renovation. Our on-site team of skilled tradesmen take pride in ensuring that the result is just as beautiful as the bathroom you imagined. 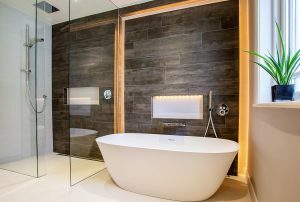 From perfectly fitted custom furniture and vanity units to installing luxurious showers and baths, these premium elements create a bathroom environment that is unique and memorable. We take pride in our reputation for producing exquisite bathroom environments. Through expert project management, our clients receive the highest standard of customer care and attention, at every stage of the process. Once again Bath House has been recognised by Houzz website, the leading platform for home renovation and design, rating us at the highest level for client satisfaction by their community of homeowners in their 2018 awards.